Get your gold headband ready: The moody queen of dance-quirk plays one show at Webster Hall. 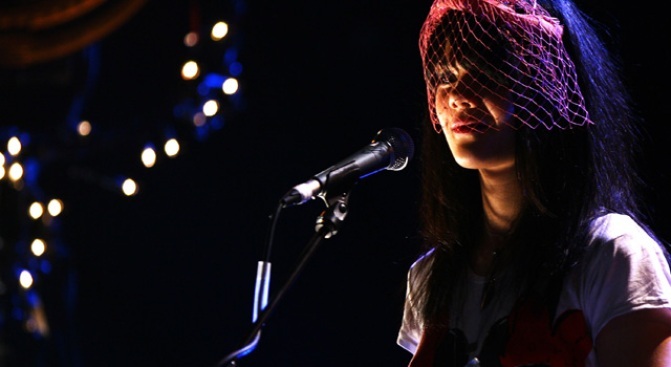 Bat For Lashes will play one NYC gig on their 2009 tour. The Event:Bat For Lashes alights at Webster Hall for one night only, coming straight off Lollapalooza in Chicago. What We're Looking Forward To: We’ve been in the tank for Bat For Lashes’ ethereal, psychedelic-meets-futuristic sound since we first heard “What’s a Girl to Do” back in ’07, when people started likening the sound to everyone from PJ Harvey to Annie Lennox. Countless successes and awards later, the BFL 2009 tour is 25 dates strong in support of their second album Two Suns, and by all accounts enigmatic singer Natasha Khan (she of the trademark headbands) is turning into quite the show-woman. Two more reasons to go: Khan’s amazingly out-there fashion sense (hello, zebra-striped pantsuit!) and the inevitable top-drawer celebrity sightings (spotted at BFL shows past: Bjork, M.I.A.). Where and When: Webster Hall, 8/12; 7PM. Cost: $20; AmEx presale on now; tickets go on sale to the public Friday, 6/12. More Info & Tickets: Check out Brooklyn Vegan and the Ticketmaster event and ticketing page.